long-flowering plants keep the show going, sometimes by producing a succession of flowers over many weeks and sometimes producing long-lasting seed heads that persists until you decide they has to go. 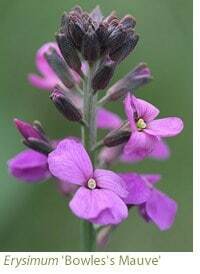 Perhaps the prize for the longest flowering span should go to the purple wallflower Erysimum ‘Bowles’s Mauve’. It will begin in March and still be going strong in late summer, popping out purple non-scented flowers above whorls of grey foliage. It’s secret is simple: it’s a sterile plant incapable of producing any seeds, although it does attract the pollinators early on. Trim it back in late summer and one good plant should make a large roundel and live for at least three years or more - for things that flower on and on usually have a shorter life than many. These Sterile plants are highly useful to the gardener, because there are no seeds just flower power. They normally occur when two closely related species hybridise and produce offspring with incompatible pollen. Plant breeders often try to produce ‘steriles’ deliberately, hoping that they will flower for months, or they can just pop up on their own courtesy of the bees. Alan Bremner, who breeds hardy geraniums in the Orkney Islands, has raised some of the best sterile hardy geraniums of all - they just go on and on. 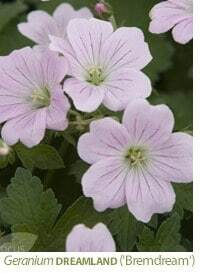 One of his newer introductions is ‘Dreamland’ (Bremdream), a veined cool pink geranium that lightly scrambles over the ground, making it perfect for the front of the border. It was discovered in Alan Bremner’s garden in 1998 and was trialled in Holland for five years to make sure it was fully hardy etc, before being bulked up and micropropagated. The pale pink flowers are non-stop, set above pale green foliage, and this hardy geranium reaches a manageable 40cm or so. 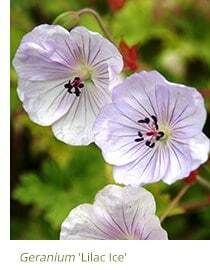 ‘Dilys’, named after Dilys Davis of the Hardy Plant Society, was one of the first Bremner-bred geraniums and the original had dark pink flowers on a sprawling plant. Now there’s a ‘Light Dilys’, with an abundance of red-veined pale pink flowers. It makes a great front of the border plant where it will thrive in a sunny position with reasonably good drainage. Other front of border hardy geraniums include Geranium cinereum, a dwarf rosette forming perennial. Until recently Geranium (Cinereum Group) 'Ballerina' had been one of the most popular cultivars, and still is with small, deep pink flowers, maroon veins and centres appearing in late spring. 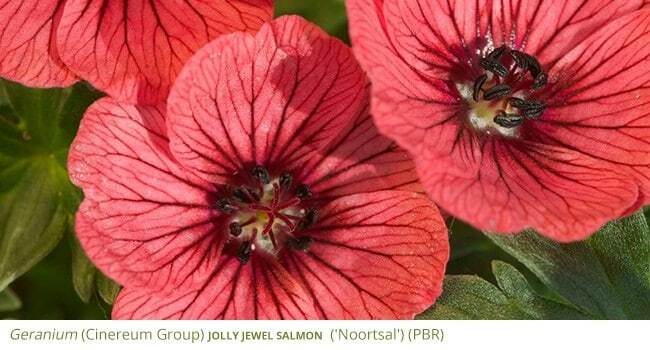 But now there is a new exciting introduction, the Jolly Jewel collection including 'Jolly Jewel Hot Pink’, ‘Jolly Jewel Salmon’ and ‘Jolly Jewel Purple' from a Dutch breeder. These gorgeous hardy geraniums are neat and compact quickly forming ‘cushions’ of green leaves, but it’s the saucer-shaped flowers which are a bright, vibrant and long lasting that will add some punch to your border. 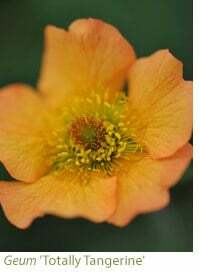 The first flowers can appear in April and then continue on periodically through to September. Easy to grow and perfect for front of border or in large pots, these geraniums also have a good resistance to disease. One more to be mentioned (although we could go on and on!) is ‘Lilac Ice’. This new addition is a sport of the ever-popular ‘Rozanne’, so it is sure to be popular. Not as vigorous as its parent but still with the qualities that we love of ‘Rozanne’, this cultivar has delicate soft lilac-pink flowers with deeper lilac veining and prominent stamens rising above pretty, slightly marbled foliage. 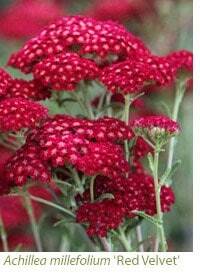 Long flowering and compact this variety is great for lining a path edge or patio pots. You’ll need more room for Bremner’s exuberant ‘Patricia’ (Brempat), because this black-eyed magenta hardy geranium makes a large, loose roundel that’s covered in flower by midsummer. It’s a showstopper and keeps going until late, when the foliage turns a sunset-red. 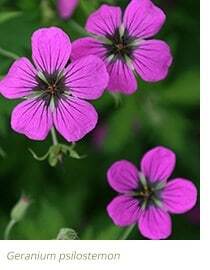 It’s a cross between G. endressii and G. psilostemon and the latter is a May-flowering hardy geranium, with dark-eyed magenta flowers, that performs in semi-shade. ‘Patricia’ inherited this trait and is very willing to flower in light shade and she’s great in a strategic position. ‘Dragon Heart’ ( Bremdra) has similarly bright flowers, magenta-pink with a dark eye, but it’s a more compact plant that rambles through things. By summer this is covered in small flowers held aloft on fine stems. Some of the blue hardy geraniums flower in early May and they make good additions to the rose border, which tends to be dominated by pinks of one kind or another. 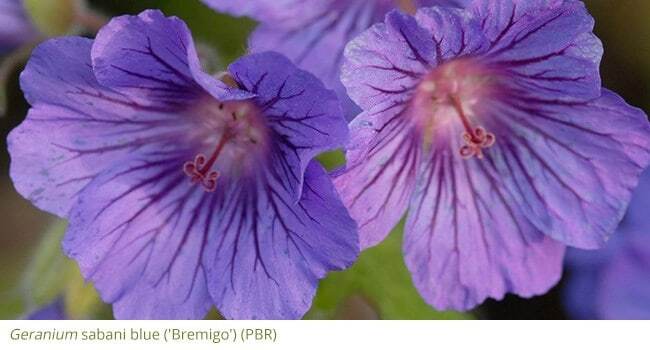 ‘Sabani Blue’ (‘Bremigo') may well replace ‘Orion’ as the ‘go to’ blue geranium, with its slightly ruffled deep blue flowers veined in purple. Once the plants are established these early flowering non-stop blues can be revitalised in June. Just cut all the foliage off to nothing and within a week new leaves will break and within four weeks you should have flowers again. Don’t do this in the first year though! When it comes to underplanting roses, grey-leaved catmints with pretty blue flowers and aromatic foliage work really well too. 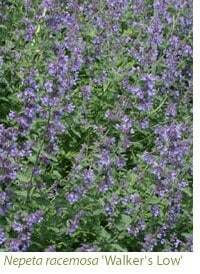 If you’re on drier soil, or have less rainfall than average, try Nepeta 'Six Hill’s Giant’, a sterile catmint that billows up into flower from May onwards. Cut it back in July, when it looks a little straggly, and it will do it all again. If you’re on damper soil, ‘Six Hill’s Giant’ may get a little floppy and thuggish, but Nepeta racemosa 'Walker's Low’ will stay compact, It’s about the same height as Alchemilla mollis, between 30 - 45cm. Add a perennial viola or two under roses, and ‘Belmont Blue’ is one of the best, beginning in May and going on through summer. Cut perennial violas back hard in early September so that they produce bushy new growth and then the tight pad of foliage will survive the winter. Left ragged and trailing, they may well die. 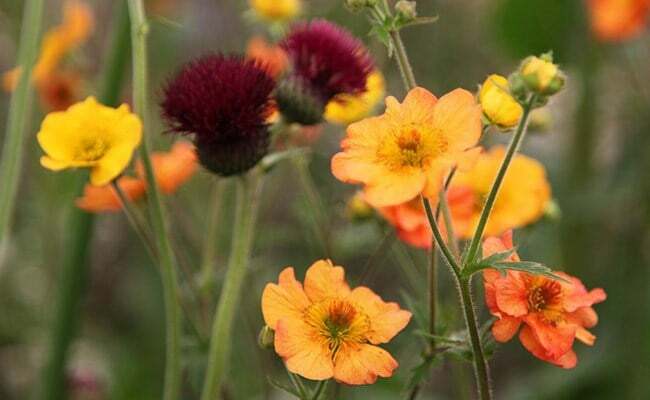 Sterile geums are also being bred and by far the most useful is ‘Totally Tangerine’ a soft orange geum that begins to flower in April and keeps going, sending out slender wands of flower until November. Deliberately bred by Tim Crowther of Warburtons Nursery in Sussex, it’s a complicated double cross that began life in 1988. Firstly G. coccineum and G. rivale were hybridised and then the best seedlings were crossed with G. chiloensis. ‘Totally Tangerine’ stood out from the others and now more sterile geums have been bred on the back of it, including ‘Scarlet Tempest’ which won RHS Cheslea Plant of the Year 2016 - a well deserved accolade for a cracking little plant, 'Mai Tai’ and ‘Cosmopolitan’, the latter part of an American-bred Cocktail series. ‘Totally Tangerine’ is a warmer colour and it can be used in so many ways. 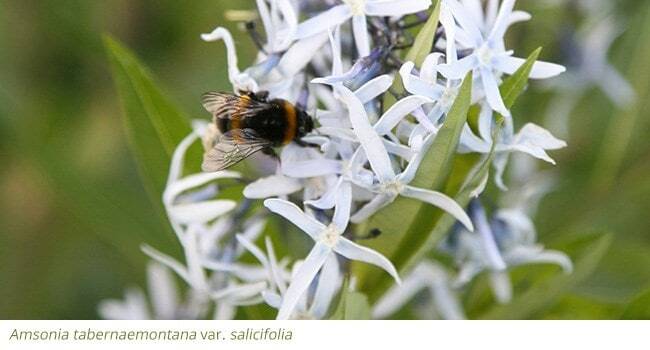 In May it could mingle among the slate-blue, starry flowers of Amsonia tabernaemontana var. salicifolia, a plant that is not nearly grown often enough. Amsonias emerge late, so watch your feet, and they take time to get going so be patient. They are worth the effort. Or you could use a structural grass such as Carex testacea, a fox sedge with russet overtones. Add an achillea or two, such as ‘Terracotta’, 'Walther Funcke' or ‘Credo’ and you’ll have a summer-long recipe of colour, form and structure for a sunny position with good drainage. You could also use the ponytail grass Stipa tenuissima, a fibre-optic mix of spring-green threads, for all-important movement and sway. It’s a combination that’s been around for many years, because it works. Achilleas are plants that fade away to form a silhouette over time and some eryngiums do this too, although they may well self seed as they go. The ultimate steel structure belongs to the biennial sea holly Eryngium giganteum ‘Silver Ghost’ and in well-drained soil this will develop a stainless steel presence with jagged bracts framing large bee-friendly thimbles. You will have to remove most of the heads, before the seeds drop, but do leave some. This biennial will die after flowering, so you need some seedlings to follow on. For a bluer structure, softer in form, opt for Eryngium bourgatii 'Picos Amethyst’, a purple-blue to turquoise sea holly that produces splayed starry bracts round a smaller thimble. Sedums have the same sort of everlasting presence, fading into late autumn. ‘Purple Emperor’ offers the best value because it begins producing its ruby-red stars in midsummer, before many others. The neat, toothed foliage is dusky in colour, as soon as it emerges and the texture reminds me of satin paints. It doesn’t go floppy and leave a gap either, so ‘Purple Emperor’ can stay in the ground without being divided. It’s extremely good with pink echinaceas, which have a dusky cone in the middle of the flower - and both are very bee-friendly summer-flowering plants. Other sedums well worth planting are ‘Karfunkelstein’, a sedum with smoky blue tinted foliage and pink flowers, 'Dazzleberry' and 'Blue Pearl’ both from the SunSparkler Series, the former with its dusky grey-blue foliage and raspberry red flowers makes a wonderful contrast with silvery foliage and ‘Blue Pearl’ the latter with small clusters of bright pink blooms, which are irresistible to butterflies, bees and other pollinating insects. Finally ‘Matrona’ a very matronly plant indeed, with pigeon grey foliage and pale pink puffs of flower that exactly catch the rather flat pink of diascias - like pigeons kissing in the border. 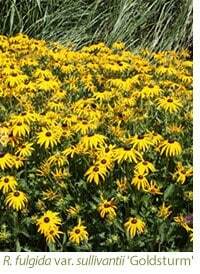 Add a long-flowering daisy such as Rudbeckia fulgida var. sullivantii ‘Goldsturm’. This crisp, brown-eyed yellow daisy flowers from the second half of summer onwards and, like many American prairie plants, it’s hardy and tolerant of heavy or clay soil. Team it with a hybrid European aster called Aster x frikartii ‘Mönch’. This produces large lavender-blue flowers from July onwards and it’s totally drought tolerant so there’s no mildew problem as there is with many American asters. ‘Mönch’ was bred from two species - the Italian aster (A. amellus) and A. thomsonii from the Himalayas and the difficult cross has never been repeated. ‘Mönch’ offers the longest flowering season of any aster and is a top-rate performer whatever the weather. If having two daisies together (the crisp rudbeckia and the languid aster) is too much, you can separate them with a floriferous kniphofia such as ‘Tawny King’. This willingly produces dusky stems topped with butterscotch and maple-syrup toned flowers. They could pick up the colour of an orange-red helenium. Summer-flowering clematis also go on and on, especially if they have double flowers like Clematis ‘Purpurea Plena Elegans’. A sultry mixture of faded damson, this old cultivar thought to have been grown since before 1629, was rediscovered growing at Abbotswood in Gloucestershire by Graham Stuart Thomas in the 1960s. It’s now widely available and, at first glance, it looks like a small rose. 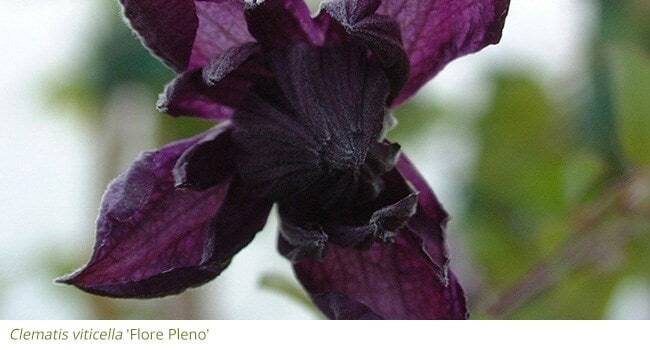 There is also a dark blue double that was called Clematis viticella 'Flore Pleno' (syn. ‘Mary Rose’) because clematis expert Barry Fretwell rediscovered it and then relaunched this equally ancient variety in 1982, the year Henry VIII’s battleship was raised. Just like ‘Purpurea Plena Elegans’ it will give you weeks of flower. The beauty with any clematis that flowers in the second half of summer is that pruning is easy. Just cut back to the lowest buds in spring. They’re also drought tolerant, so there’s no problems with wilting. They couldn’t be easier, so get planting!